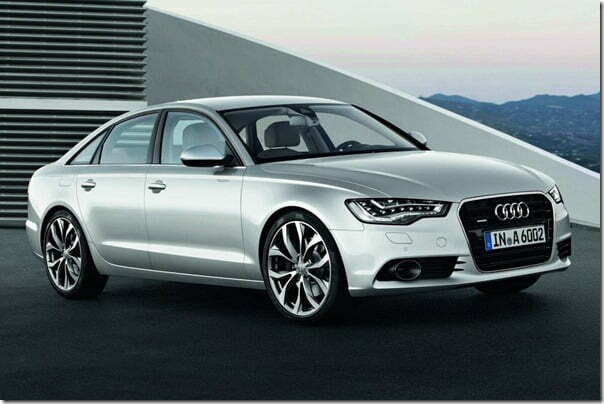 Audi is going to launch its luxury sedan Audi A6 in India in July 2011. The launch was expected around September 2011 but will happen before that now. Audi is very aggressive in India with its product launches in almost every segment of Luxury cars. Audi realizes the potential of the growing Indian luxury cars market and will bring its all new Audi A6 next generation in India in July 2011. The new A6 has been improved both aesthetically as well as in performance over the older A6. Audi A6 in India will be available in four engine options- a 2 Litre Diesel engine, a 3 Litre Diesel a 2.8 Litre petrol engine and a 3 Litre Petrol. The 2 Litre Diesel engine will be a turbocharged CRDI engine with a peak power of 175 BHP. The 3 Litre TDI diesel will produce a peak power of 242 BHP. The 2.8 Litre Petrol FSI will peak at 201 BHP and the 3 Litre supercharged FSI engine will churn out a max power of 296 BHP. Audi A6 comes with high aesthetic appeal, it has a wraparound dashboard on the interiors, Quattro four-wheel drive system, automatic transmission 7 speed with S-Tronic dual clutch in the high end-variants. Dual row-LED head lamps for a sleek looks, low roof-line, large alloy wheels, use of aluminum in car body for about 80 Kg less wright compared to old gen A6 etc. are some features which make it stand out. A Larger wheelbase for better handling, more fuel efficiency because of lesser weight, self-tracking trapezoidal-link suspension in the rear and five-control-arms-suspension at front wheels made up of aluminum linkages. The A6 will be an aggressive competition of the BMW and Mercedes Benz cars in the price segment of Rs. 35 Lakhs to Rs. 50 Lakhs. The pricing of the new Audi A6 2011 is expected to be between Rs. 37 Lakhs to Rs. 47 Lakhs ex-showroom.